Learning to use CAW, the easy way. Tutorials and Downloads. 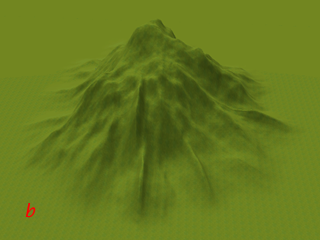 Here is a detailed but simple way to sculpt Mountains. 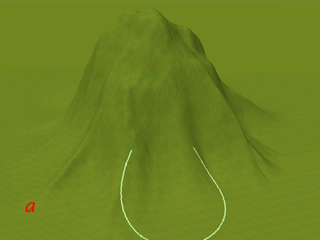 Using this technique you can make most any Mountain you may imagine. 1. 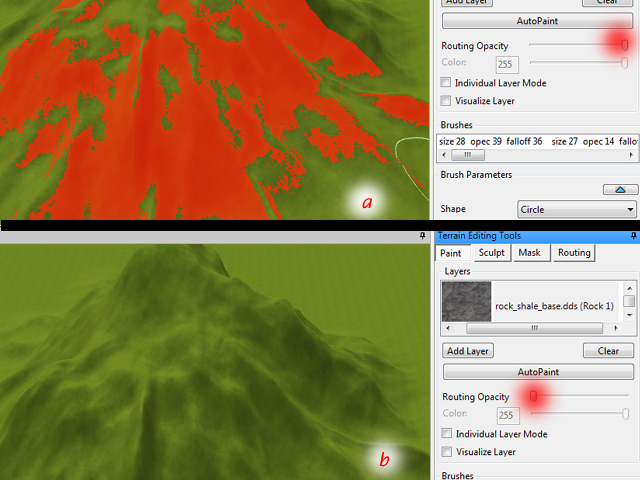 Click the Terrain Tab which will open the Terrain Editing Tools panel. Click the Sculpt tab. Click Mountain. 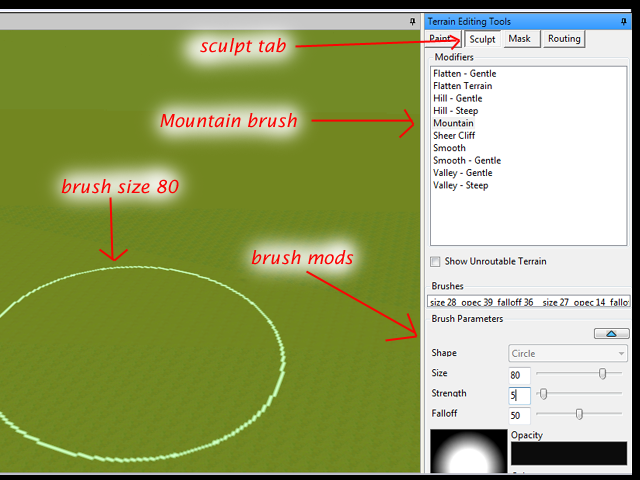 Brush Parameters are Size, Strength, and Falloff which I have coded for this tutorial as S- size, O- strength and F- falloff. 2. Below are 3 examples of Brush Strength and how it affects your Mountain. 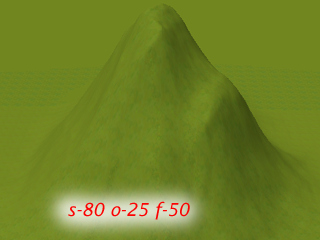 Fig A below is s-80 o-5 f-50 Mountain and it gives an almost smooth effect. 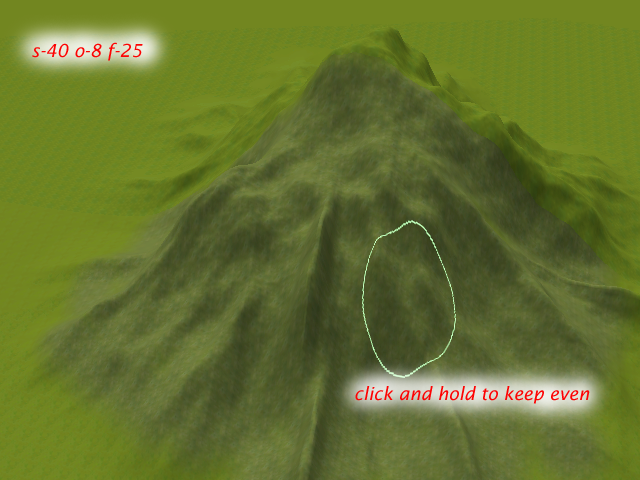 It also takes longer to create the mountain when you click and hold. Fig B is s-80 o-15 f-50 and Fig C is s-80 o-25 f-50. As the brush strength increases so does the roughness of the mountain. Plus the Mountain grows fast at high strength. Try the different brush sets in the examples and see how it feels. 3. 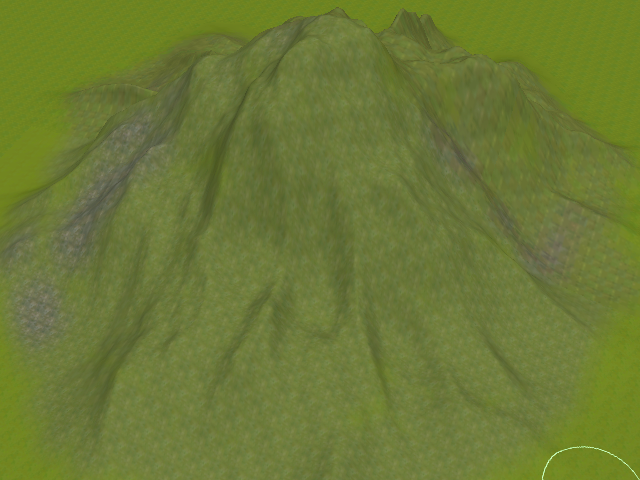 Now lets make a Mountain. First set Mountain brush to s-80 o-15 f-50. 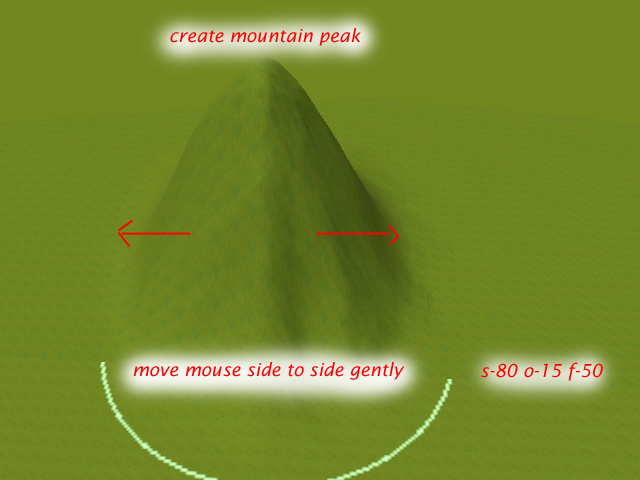 Click and hold and move mouse side to side gently to create peak of mountain. Stop when you have reached the height you want. Note that objects in CAW look smaller than they are in the game. So be sure to zoom in to see the actual size. 4. 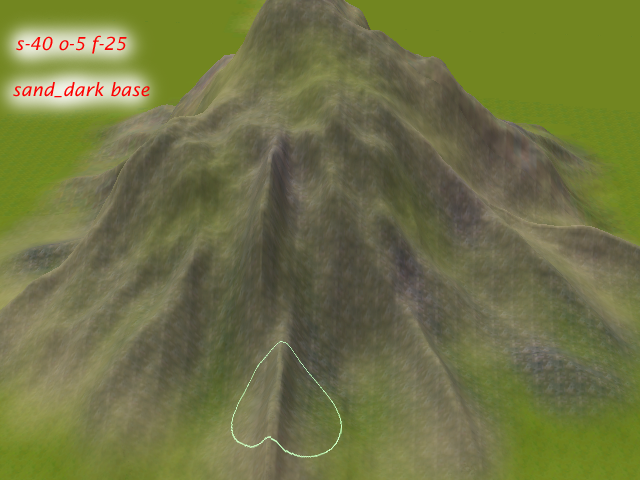 Next expand the base of the mountain. Set brush to s-40 o-10 f-50. 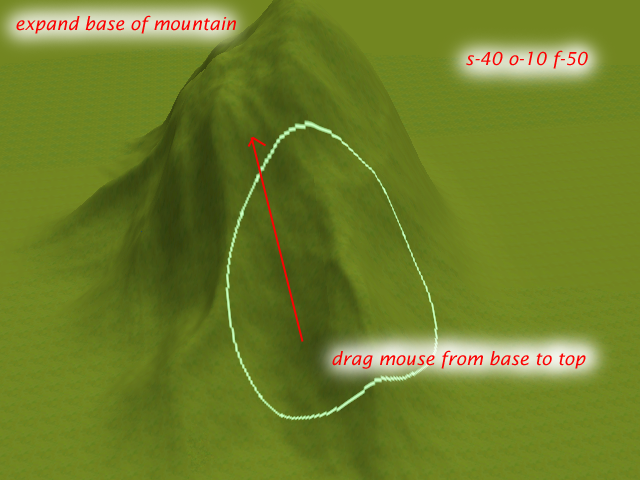 Click and drag mouse from base to the top of the mountain. Go all around the mountain. This is not meant to be perfect. 5. Continue in this until you achieve the mountain size you want. As in b below where I have completed my mountain. Note: Use One click at a time so that you can undo mistakes with the Undo button easily. 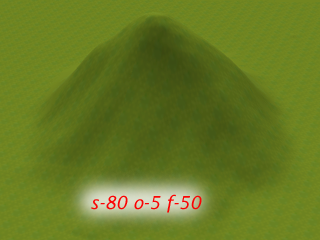 It takes less than 5 minutes to create a full mountain. For an even more detailed Mountain skip to step .15. below. 6. 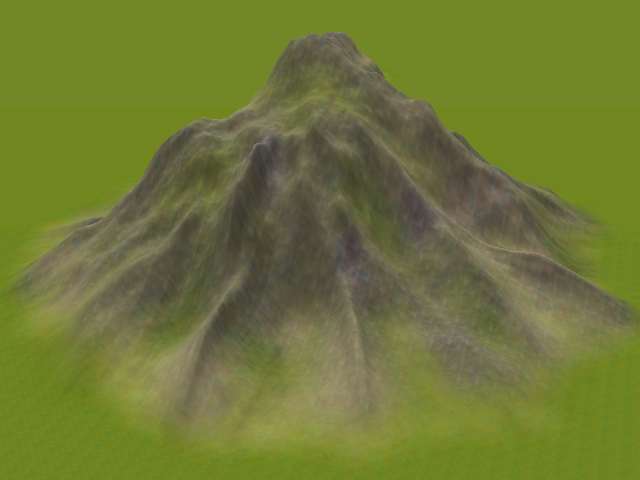 Although this lesson is not for Terrain painting, I shall go into a simple method of painting a mountain. 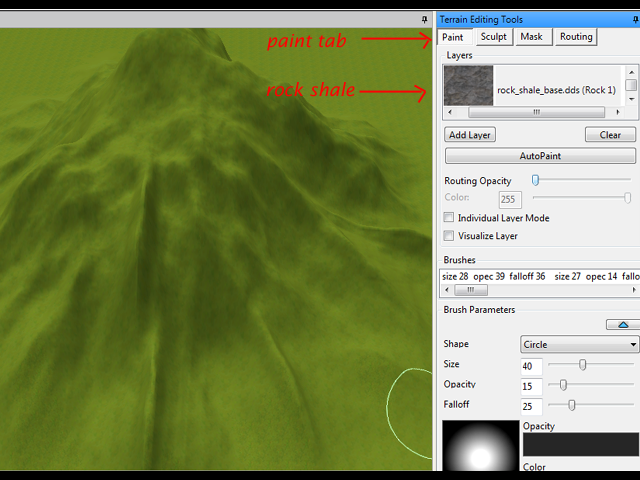 Under Terrain Tab which will open the Terrain Editing Tools panel. Click the Paint tab. I shall be using the default textures for this. 7. Double click to select rock_shale_base.dds. Set brush to s-40 o-8 f-50. 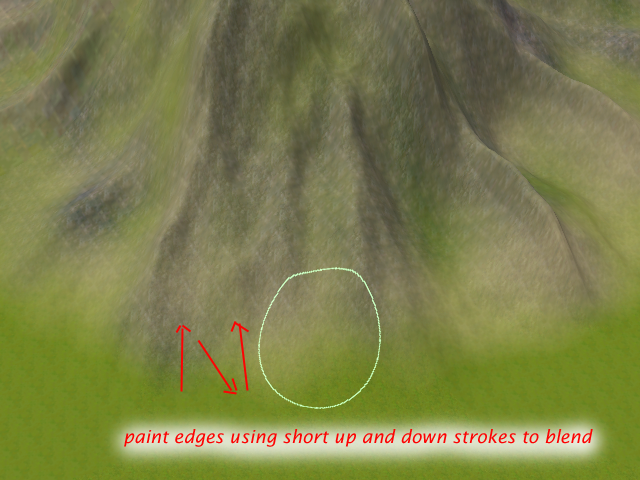 Note when you zoom in to paint if the mountain turns red as below, just reduce the Routing Opacity as in fig a and b below. 8. Now back to the painting. 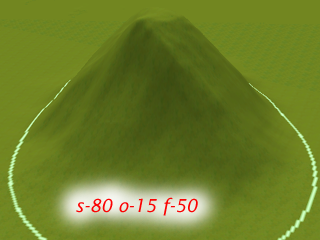 With your Brush set on rock_shale_base.dds s-40 o-8 f-50, Click and hold the mouse button and paint the entire mountain. This is the first base coat and it should be light. 9. Complete one side, turn the mountain around and do the other side. As you can see the parts where the paint overlapped is darker. I shall explain this more in Terrain Painting tutorial. 10. Next, with the brush still on the same settings, do another layer of paint, but this time only on the ridges. Do this one click and drag at a time. It is not meant to be perfect. 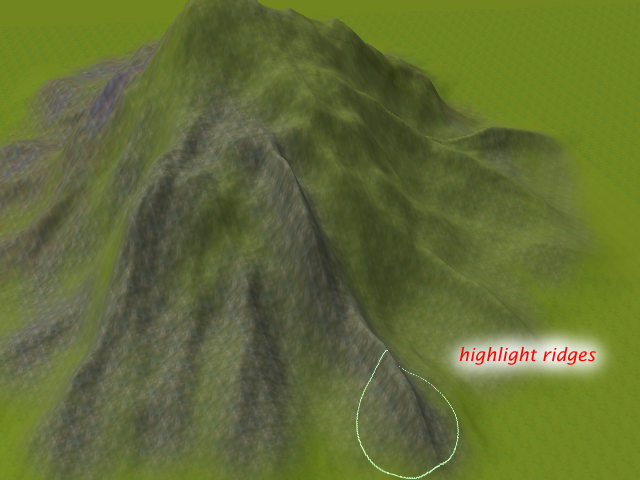 Just go round the mountain and highlight the upraised parts. 11. When you are done, it should look something like this. You can stop here if you want. Depending on the Texture/ Paint you use, this is usually sufficient. But if you are using rock_shale.base.dds, go to the next step. 12. 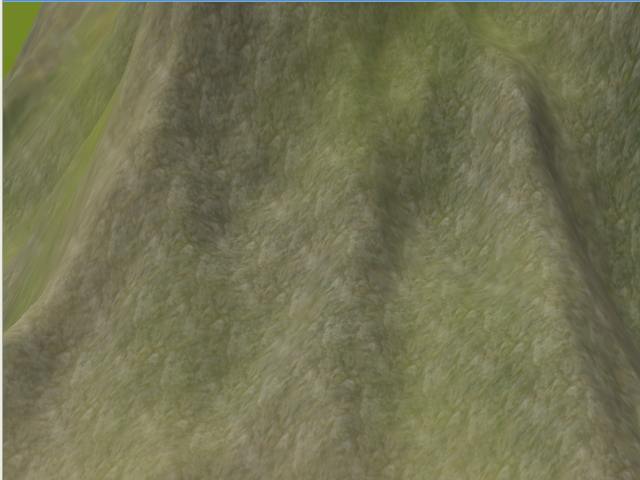 Keeping in mind that not everyone wants to download custom textures, Rock Shale Paint is still good, it is just a matter of how to blend it. 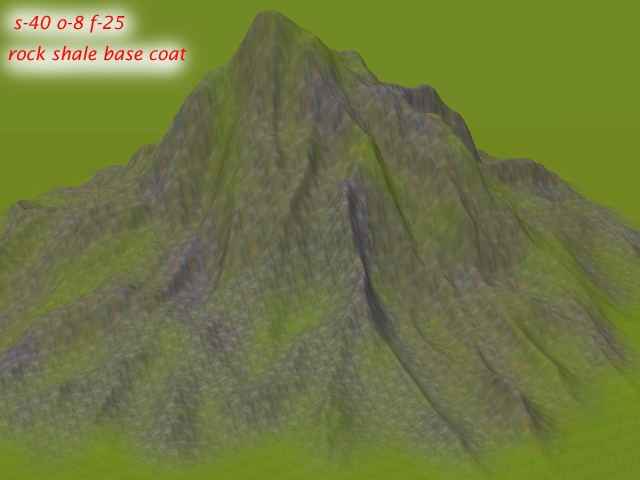 So, Double click and select sand_dark_base.dds, set brush to s-40 o-5 f-25. Click and hold and cover the whole mountain. 13. 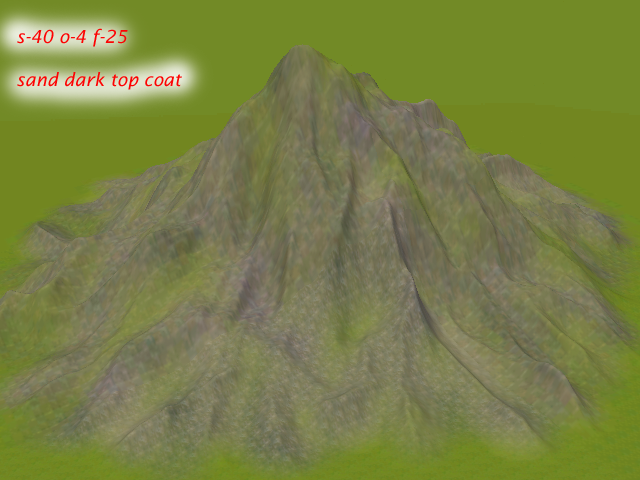 Paint the base of the mountain with the Sand texture using short up and down strokes to blend the mountain with the ground. This is to avoid having a perfectly straight line. 14. Ta-daa!!! Mountain complete. 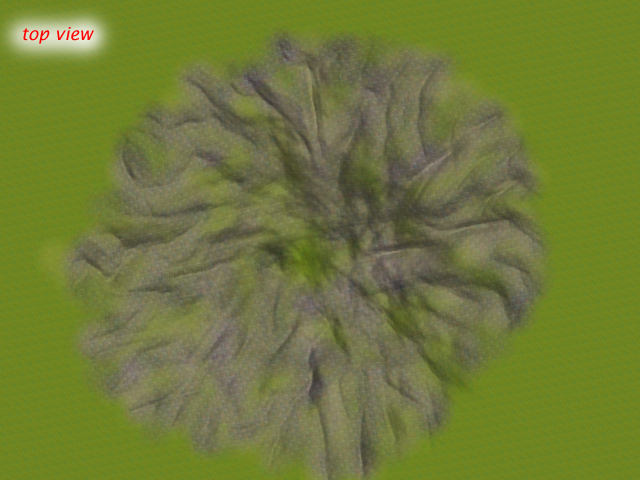 Not bad for only 2 textures, right? Here is a close up shot of the texture. 15. 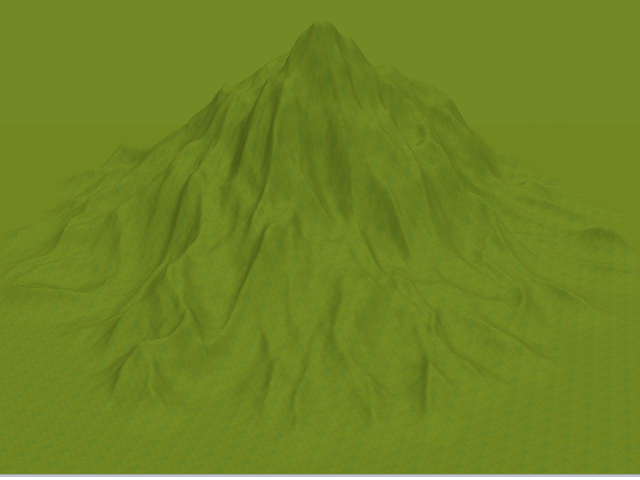 Now for a more detailed mountain than the one in step 5 above, set you Mountain brush to s-20 o-10 f-50. 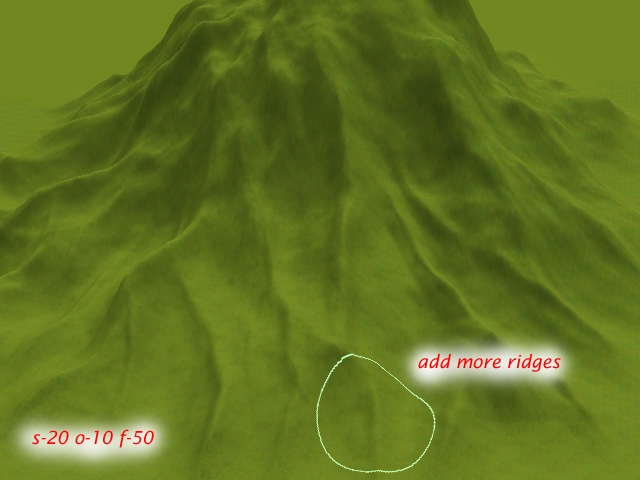 Use it to add more ridges and details all around the mountain. there is no rule to this, just follow your instinct, and do it One Click-Drag at a time. Here is a shot of the top view. It's a nice even circle. And that's all there is to it. But Note the Following. 1. You can set your brush sizes to whatever you wish. Just be sure to keep you strength to about 10% of the brush size, and your falloff to about 50% of the brush size. It is all about proportion. Test and experiment and save the sets you like. 2. 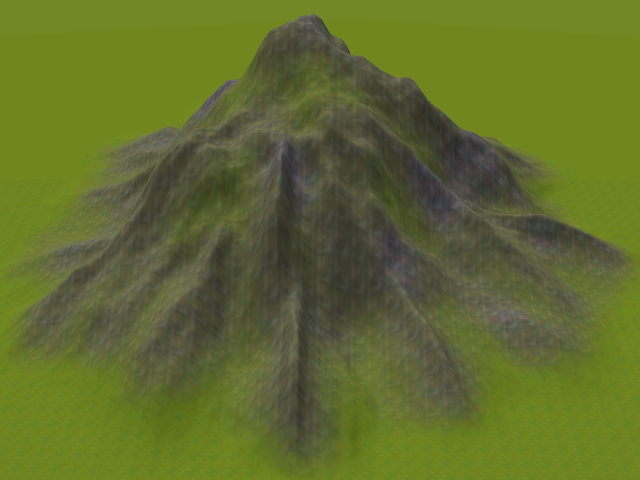 To make really big multiple Mountains like in sunset valley, you have to layer the mountains. That is make several bases and build one over the other till you get what you want. Don't just click and drag one giant lump. 3. Your mountain may be smooth or rough. Just adjust your Strength accordingly. 4. Depending on the Paint/Texture you are using, you may have to adjust your Strength as some paints are darker than others. 5. Always Brush up and down, not side to side as this follows the natural shape of the mountain. Perfect, this is just what I needed! Thank you for sharing! Waaaaay late to the party here. Your blog is a godsend! I always wanted to try my hand at caw but could never get things to look the way I want. This is the 3rd tutorial I've used and they have all been super helpful. Thank you so much! I am completely off the grid this year and I sincerely apologise. You are welcome and thank you so much for using my tutorial and finding it helpful. I really appreciate it. Hi, my name is Kaine, and these blogs are some of the things I do in my free time. A Sorta Fairytal Legacy 1.2. ©2011. Picture Window theme. Powered by Blogger.